Well, what do you think? Is this the Samsung Galaxy SIII? The picture above appeared on reddit this morning and includes enough interesting tid bits to get us to at least write about it. Could it be a complete fake? Of course it could be. Are we willing to at least discuss it and then decide? Yep. How about that phone? The device design mimics that of the new Galaxy Tab 2 with its silver edges, a move that was initially made by Samsung to get Apple off of their back. The screen appears to be massive and is edge-to-edge, something we have been waiting for on a mobile device. The bottom – unfortunately – does not have on-screen keys like we have seen on the Galaxy Nexus. 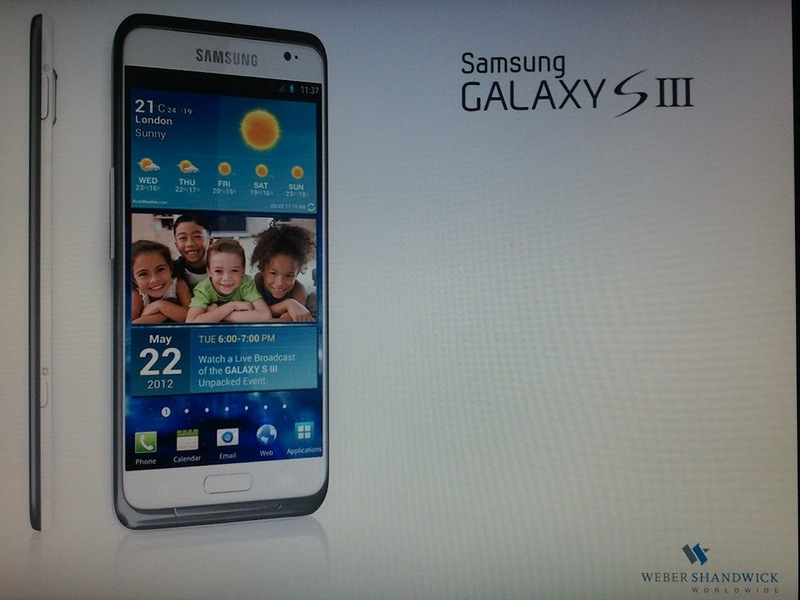 The single home button is featured as it was on the Galaxy SII and Galaxy Note outside of the U.S. (something we have mixed feelings about), meaning we will see menu and back buttons on its sides if this design ends up being real. There is a lock switch and dedicated camera button on the right side, along with a volume rocker on the left. A front and semi-protruding back camera are visible. The device is running some form of TouchWiz, but we expected it to. As far as the items on the screen go, we should talk about them. The calendar is set for May 22 and mentions that you can watch the Galaxy SIII Unpacked Event live (potentially in London). Samsung, in the past, has held “Unpacked” events to launch some of their newest and most important products, including the Galaxy SII, which had a similar calendar hint on its press photo. What is up with the “Weber Shandwick” logo in the bottom right? That is a legitimate PR company, so the fact that it is featured on this slide is noteworthy. Samsung uses a different PR group for most of their mobile press stuff, but Weber is in the mobile game and could have joined Sammie for some SGS3 fun. “Could” being the key word here. Real or fake? Like I said in the beginning, this is a nice hack job if it is indeed fake. It looks semi-legit and has plenty of info to create a stir this weekend. I’ll leave it with you to tell us what you think.